Cumbres & Toltec Engine #484 prepares to get underway. 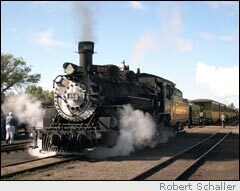 In August 2004, I rode the Cumbres & Toltec Scenic Railroad from Antonito, CO to Chama, NM. 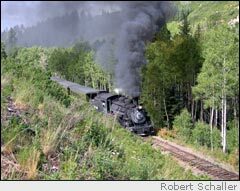 The railroad runs over the Cumbres Pass and through the Toltec Gorge. The train runs one way per day, and the railroad arranges for a motor coach to the departure station from the other end. I stayed in Chama and took the coach to Antonito, arriving there about 20 minutes ahead of boarding time. With time to kill, I took a look at the C&TSR's most venerable locomotive -- No. 463, once owned by Gene Autry, is presently awaiting restoration in the Antonito engine house. In operation until recently, perhaps it will be again after restoration. Number 463 is a Baldwin steam locomotive built in 1903. It's a "Mikado," the railroading name for a 2-8-2 locomotive. "2-8-2" refers to the configuration of its wheels; two leading wheels, eight drivers, and two wheels trailing. All the narrow gauge engines operated on the C&TSR (and the Durango line) are Mikados. They were the most powerful locomotives operated on narrow gauge railways. Old #463 looks pretty sad today, but perhaps brighter days are ahead. After visiting the engine house, I boarded the train. The train consisted of an open-air "gondola," several coaches with large roll-down windows (in case you want to breathe in the aromas and textures of cinders and smoke), and a snack/gift shop car. There was a "first class" parlor car for those that paid for the extra comfort and privilege. I took my seat in coach and stayed in it most of the day. While many passengers stayed on the gondola, I enjoyed the views from the coach just as much. The first part of the day sees the train climbing slowly out of Antonito, across valleys, over trestles, up hills and ridges, through tunnels, and around several curves where the train doubles back on itself and you can wave to the engineer as he waves back at you! A small electric utility car follows the train, armed with a couple of hands, shovels and water to put out any fires caused by a locomotive that burns 4,000 lbs of coal on each 64 mile trip, all hand-shoveled. Lunch is at Osier, with a choice of entrees; seconds are encouraged. 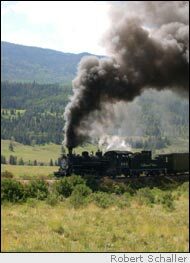 Afterward, the train winds its way along a canyon above Los Pinos Creek, over Cumbres Pass and down a 4% grade into Chama. Along the way, I saw cowboys and their dogs working a herd on a distant hillside, elk and deer, and I got to stare down in awe 137 feet to the bottom of the canyon at Cascade Creek, from the train's seemingly precarious perch on the trestle above. Just below Cumbres Pass, the line runs around "Windy Point," where the rails cling to a rock ledge several hundred feet above the valley floor. The grade was blasted out of the rock sides of the mountain. This cut is still world-famous today as an example of "extreme" railroad engineering. Once past Windy Point, the engineer does a spectacular "brake check" which results in jets of steam shooting from the sides of the locomotive for 20-30 feet or more. Then the train slowly moves down the mountain and the Chama Valley, and the ride is done. Along the way, the crew points out a water tank constructed for an "Indiana Jones" movie -- in which the hero swings onto a train from the water spout. The water tank is there for you to see, a bit of movie memorabilia in the mountains of northern New Mexico. Ironically, the tank, built for the movie, was never used by the railroad! The ride ended in Chama at about 4:30 p.m. All in all, it was a great day of railroading!